As co-chairs of CGT’s Executive Council, we seek your active participation and leadership in our journey. We recently increased the size of the EC, which is now stacked with thought leaders and business practitioners who are committed to transformational business gains. The EC’s renewed energy and commitment to profound business improvements place it at an inflection point to have material influence in the marketplace. We sincerely seek your contributions, questions and input to help us respond to the vast opportunities available at the intersection of consumer goods and technology. A Smart Community Makes the Difference. Our community thrives when we have smart, open, transparent collaboration. Today’s business environment reflects increasing technology complexity and clutter. Our individual operating settings and our retail partners’ requirements for insights/data are ever expanding. Bold, unfettered dialogue on what is and isn’t working can make all the difference. CGT’s publications and events are among the few distinct information sources and communities that can foster this dialogue. Through an expanded, intentional effort to contribute and leverage this community, the business and professional impact can be significant. Conversely, not tapping into available resources for insights will impede even the best-coordinated efforts at business development. Pictured above, from left: Executive Council members Julia Anderson of Smithfield Foods, Michael Forhez of Oracle, Constance Howlett of Estee Lauder, Steve Sigrist of Newell Brands, Tony Bender of Edgewell Personal Care, Kevin Puppe of Johnson & Johnson, Albert Guffanti of CGT, John Phillips of PepsiCo, Justin Honaman of Accenture, John Rossi of Capgemini and Mike Gorshe of Accenture. In this unique space, we can work together to create a dynamic alignment of industry “know how” and technology deployment that can be an extraordinary accelerant to business growth and profitability. The question isn’t whether we need to align to understand technology innovation, but how we can better align? Embrace Necessary Change. 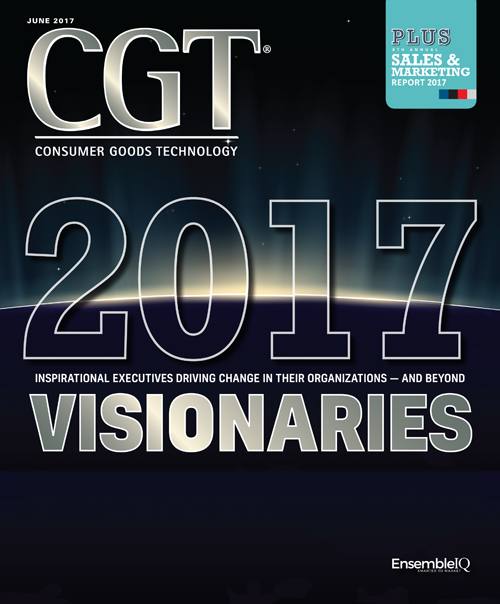 The CG industry is gearing up for changes and adaptations in distribution strategies and evaluation of key measures. Our retailers’ focus on comp-store performance and sales per square foot, while still important, is now measured side-by-side with total traffic, omnichannel gains, inventory productivity, and reduction in vendor turn times. The best CG, technology and consulting firms will equip their teams to capture insights and quickly respond. The EC is on the front line of these efforts to understand effective approaches and learn from failures. Many changes will be taking place, but we will be there to capture the results, identify the trends, and uncover the “voice of the shopper” to fully understand future business priorities and opportunities. Strategy Matters. Sound strategic direction stems from thoughtful attention to the business horizon. The technology horizon is where CGT and the EC will seek to exceed. CGT’s foundational core of understanding technology innovation, effectively applying that technology, recognizing competitive strategies and identifying emerging trends can be a tremendous resource in the development of your own strategic guideposts. Our aim is to pool resources, experiences and our passion for practical innovation to strengthen the community’s strategic capabilities. We’re confident we can build an even stronger environment of collaboration and thought leadership. Steve Sigrist is vice president, customer service North America for Newell Brands. John Rossi is vice president-consumer products, retail & distribution consulting at Capgemini.